Trend number 5 in Nielsen Sports’ Commercial Trends in Sport 2017, is live sport gaining traction on OTT and social media. One man who has been on the OTT trail, from the early days, and even by his own admission, maybe a little too early, is Chris Wagner EVP and co-founder of NeuLion. For 14 years, NeuLion has been a worldwide leader specialiSing in digital video broadcasting, distribution and monetization. NeuLion deliver live and on-demand content to every Internet-enabled device imaginable. Chris has held numerous executive positions in the technology sector. The growth of internet television on computers, tablets, mobile, and internet-connected devices, has given Chris an opportunity to work closely with the largest brands in the sports and entertainment industry including the NFL, NHL, UFC, NBA, Univison, Dish Networks and many others. Chris joins us to discuss the OTT landscape and how rights holders can capitalise on it. 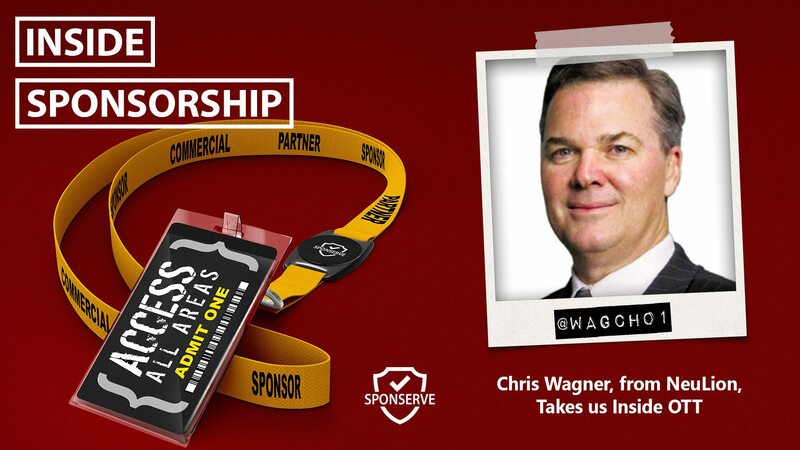 If you would like to connect with Chris, you can do so on LinkedIn, Twitter or email using chris.wagner at neulion.com. Be sure to download NeuLion’s free eBook From Lead To Customer: Turning Free Trials Into Paid Accounts. Also joining us on the show is Sam Irvine, SponServe’s GM of Product, who, in this ongoing series, ponders his past life as a commercial manager at a rights holder and what he wishes he knew. Then, he pens a letter to his younger self.